Back at home if you went to have chinese food, it was Chilly Chicken, Chicken Manchurian , some kind of noodles etc....... and if you eat these dishes they were super spicy which we all loved it. Just thinking about those spicy dishes make me drool. So we went to this posh looking Chinese Restaurant and they gave us the menu card and I was expecting the usual Spicy Chillie Chicken etc.... but the dishes in the menu card was totally newto me and we ordered our dishes and I have to say I was ( We) blown away, the food was totally different than the chinese we were used to and even the dishes were present in such a way example on top of some seaweed etc......and the taste it was nothing like i have ever had, the dishes were not that spicy but they were really so super yumm. That is what I think about this Chicken dish. It is not spicy at all there is not even a chillie in the dish. It is really authentic , it has to be,as it comes from Bee's book Easy Chinese Cook Book. 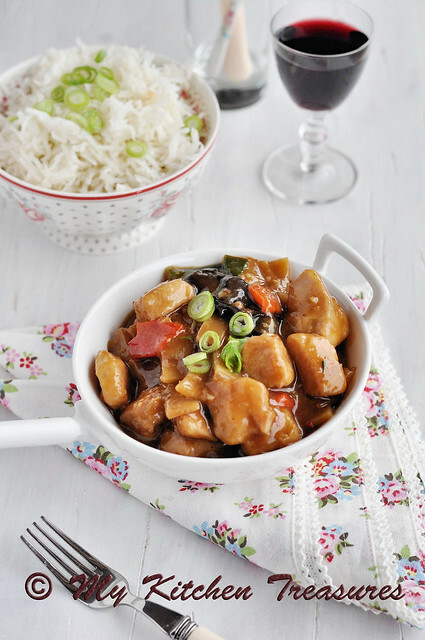 As you know I am in love with this book, I have made few dishes and it always comes out delicious like this Kung Pao Chicken. I always use the tenderizing method Bee mentioned. Treat the chicken according to ow to tenderize te chicken. This is a optional step. Soak the wood ear mushroom in warm water,about 15 minutes and then cut into pieces. Marinalte the cicken pieces with rice wine and corn starch for 10 minutes. Mix all te ingridients for the sauce in a small bowl and set aside. Heat 1 tbsp of te oil in a wok over a high heat. Add the chicken and stir fry untill it is half cooked or turned opaque. Heat the remaining 2 tbsp of oil in the wok over hight eat. Add te garlic and stir fry untill aromatic, then add the wood ear mushroom, bell peppers and bamboo shoots. Stir fry the ingridients untill you smell the pepprey aroma from te pappers, about 1 minute. Return te chicken into the wok, stirring well to combine with the ingridients. Pour in the sauce and stir continously untill the chicken meat is well coated with teh sauce. Stri in the green onions, dish out and serve with steamed rice. The presentation is beautiful and I bet so is the taste. Waw, Finla, this looks amazing! I would like to eat it straigth away! 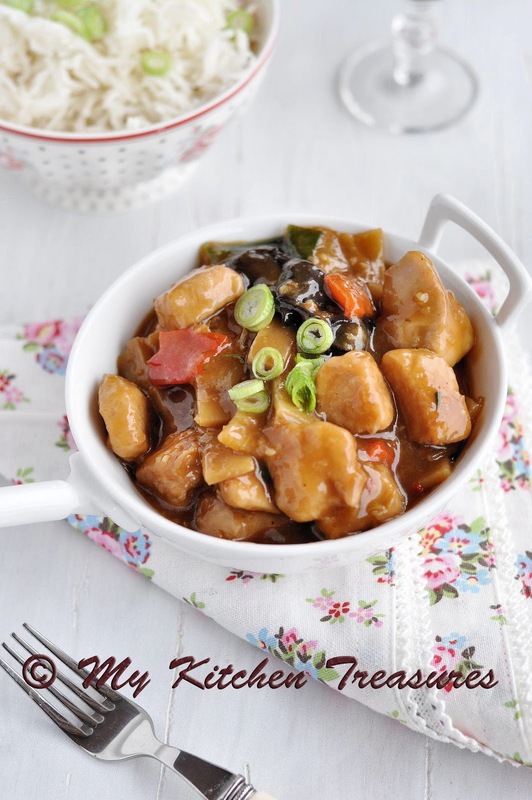 I must remember this recipe as my husband loves Chinese food.... If I can find the ingredients I will give it a try! Marian you will get all the ingridints in Delhaize, except the black vinegar. So tempting Chicken recipe, looks so yummy n juicy. Yum! I bet I am going to like this garlicky sauce! My comment got Lost !!!!! What a simple and delicious dish! Bong Mom it must be blogger playing up. I am loving this recipe - it looks delicious! This looks delish HC - I would happily eat this for dinner. Hi FInla, I bought all the ingredients (except for the Chinese rice wine, which they didn't sell in the Delhaize , I bought dry sherry). What alternative do you think I best use for black vinegar? normal, rice or wine vinegar? Thanks for letting me know :-). I can't wait to try it out! Can I put it on my blog, with of course a reference to yours? Marian sherry is good if you do'nthave the rice wine even i do that, try red wine vinegar instead if you have at home or any vinegar. Happy cooking and you too have a nice weekend. yummmmmmmy! will definitely try it! This dish looks delicious! Love the all of the veggies with the chicken, and then the sauce - WOW! Great recipe! garlic chicken looks so inviting! super yummy! The Chicken sounds divine. I bet it tasted great too.